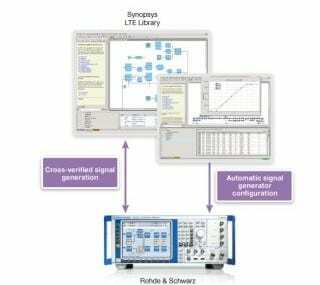 Synopsys is providing access to its standards-compliant reference libraries of algorithms for end-to-end simulation of uplink and downlink transmissions over LTE and LTE Advanced, while Rohde & Schwarz is providing signal generators, which have been verified against the Synopsys libraries. The specific libraries that Synopsys is contributing are for its System Studio and SPW algorithm-design, while Rohde & Schwarz is providing its SMU200A and SMBV100A vector signal generators. The move should enable engineers to be more confidence in generating standards compliant equipment, and will reduce the time it takes to test, and therefore time to market. “A combined compliance approach significantly reduces the time to the first test and enables the most efficient interaction between our algorithm designers and system integration engineers,” said Robert Peloso, director of engineering management for InterDigital. Rohde & Schwarz recently attended the LTE World Summit 2011, which took place between 17-18th May 2011 at the RAI, Amsterdam.